Ramallah, West Bank - Far from the children who beg for change from idling cars and the teenagers who hurl rocks at armed Israeli troops, a different spectacle of Palestinian youth is playing out in the ballroom of a luxury Ramallah hotel. 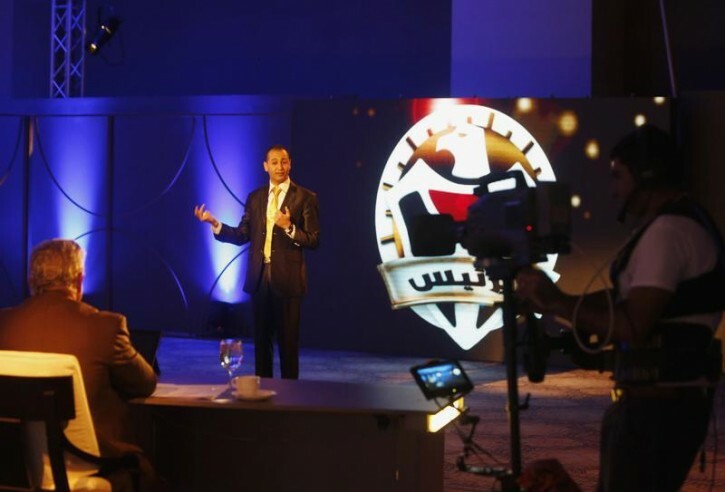 Young contestants are gathered for a taping of “The President”, a game show that aims to select a “new leader” for the Palestinians based on their views on the pressing political issues of the day. The panel of judges is made up of top officials and businessmen. Bleak Palestinian realities mean whatever comes out of the contest to be “The President” will have only symbolic significance. The winner will be “ambassador for a day” at one of the Palestinian missions in Europe, among other prizes. But it’s a rare chance for a frustrated and marginalized generation to air their views. 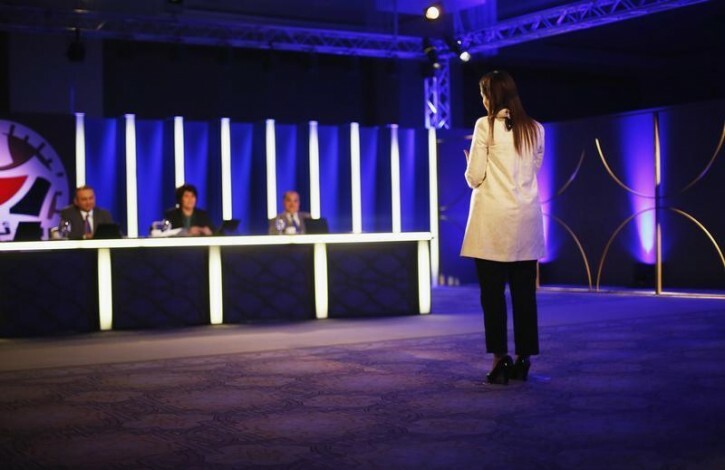 Hanan Ashrawi, a veteran of the Palestine Liberation Organization (PLO), asks a contestant in the Gaza Strip, on which Israel has imposed a tight blockade, about the smuggling of goods from neighboring Egypt. “What about the tunnels between Egypt and Gaza, what would you do about that?” she asked of the trade, which bypasses both Israeli and Palestinian officials. “Well, the goods going through them create an illicit economy which isn’t taxed and take away government revenue,” answers Jihad al-Jaabari, who is taking part in the show via a remote connection from Gaza. “Do you speak Hebrew?” an Arab member of the Israeli legislature, Ahmed Tibi, chimes in. “No…but it’s important to learn the enemy’s language,” Jaabari replies, eliciting slight smiles from the judges. Almost a third of the 4.2 million Palestinians in the West Bank and Gaza are between 15 and 29 years old, and a third of this youth bulge have no jobs and scant opportunity to challenge their own ageing leaders, let alone Israel’s occupation, beyond taking to the streets. After the Islamist Hamas party’s surprise 2006 electoral win, the Palestinian parliament has not met for six years and fresh elections are long overdue. Following a brief civil war with President Mahmoud Abbas’ Fatah in 2007, Hamas now rules over Gaza while Abbas’ Palestinian Authority governs the Israeli-occupied West Bank. Abbas, 78, has outstayed his mandate by four years and has no clear rival or successor after Prime Minister Salam Fayyad resigned this month. In the meantime, real wages have declined by around 8 percent since 2006 and a third of Palestinian homes do not have secure, reliable access to food, the United Nations says. Youth despair of ever having control over their futures. “We’re a people under occupation. We feel failure while hunger and unemployment rise. We see corruption and foreign aid distracting our leaders,” contestant Maher al-Komi, 25, from the West Bank city of Hebron, told Reuters. “I have a degree in media but I work in a corner store. I hope my speaking on this show will make those in charge realize the problems of youth and make changes,” he said. While Palestinian politics may be in a moribund condition at the national level, the paralysis has not stifled youthful debate, however. The main university of Nablus in the West Bank was a riot of yellow and green flags, the colors of Fatah and Hamas, on the day of the student council elections last week. Fatah’s “Martyrs” bloc and “Muslim Palestine” led by Hamas were the two main contenders to lead the 22,000-member student body, with Hamas taking part for the first time in six years. Both candidates made similar campaign promises about student loans, Internet access and better classroom conditions, but it was ultimately a popularity contest along party lines. In the end, Hamas barely lost out to its rival in a ballot widely seen as a barometer of the Palestinian popular mood. The real platforms of Fatah and Hamas are poles apart, conceded Bassem Sati, 24, as he milled around the campus with a bandana of Hamas’s trademark green over his shoulders. Fatah officials in recent years explored the idea of creating a vice-presidency under Abbas, hoping to avoid having to devolve power to the Hamas speaker of parliament, as per Palestinian law, if something should happen to the ageing president. The drive was ultimately dropped. Most Palestinians feel the split in their leadership has distracted them from the real struggle - coming up with a national strategy to confront Israel’s occupation. “We hope the will of the youth will bring Fatah and Hamas together. Of course, we want Fatah’s focus on negotiations to give ground to our choice of resistance,” Sati said. “An uprising will give us suffering and attacks from the Israelis, but we need it to gain our freedom, and we are ready to sacrifice,” he added. Mervat Abu Hijleh, sporting a T-shirt and Fatah’s black and white chequered headscarf around her neck, said school elections provided an example of the healthy competition that could revive flat-lining national politics. “We see how old officials are, how little action is being taken and we see the need for change. We, the youth in this vote, are that change, and the different parties can at least agree on that,” she said. Nearly three quarters of young people from Gaza, East Jerusalem and the West Bank are not affiliated with any party and say the factions have not earned their trust, according to a survey of 1,851 people aged 15 to 29 published this year by the Sharek Youth Forum, a local non-governmental organization. Almost two-thirds believe a combination of Israel’s policies and internal politics will doom efforts to establish a Palestinian state. But a slim majority also said they believed Palestinian youth have the ability to bring about change. It’s unclear how much longer they can retain that optimism, however. Despite the ambition and enthusiasm on display on the set of “The President”, a different reality is the rule on the Palestinian street. Local people gathered at a mosque in the town of al-Ram in March were attending the funeral of a resident who medics said was killed by an Israeli teargas round fired into his taxi during clashes between soldiers and youths. As the corpse was carried toward the cemetery, a young man in a soccer jersey wrapped a shawl over his face so only his eyes were visible. He and his friends were preparing again for a street battle, trading rocks for Israeli soldiers’ bullets. “If I die, good, I welcome that. I would be dying for our martyr and our people,” he said. These animals don't want any 'peace', all they truly want is the entire 'piece' of Israel, which they'll never ever get. You can see and hear their hatred towards Israel in their writings and in what they say about Israel and its people. When they call us the 'enemy' don't shy away from believing precisely how they feel about us, yet they expect Israel to concede huge amounts of territory and return to the Auschwitz lines of '67. Are they mad for requesting us to commit national suicide or are Israeli leaders mad for even entertaining such unrealistic possibilities. Very Biased article, it's all about their suffering, the occupation and the "brief" civil war with "Muhammad Abbas". Nothing about the terror (killing of babies and the honor bestowed on them for doing so by Fatach and Hammas) of over 60 years, the rejection of every offer of sovereignty, the withdrawal of Gaza and the terror attacks that followed, it's all Israel's fault.